With just under three weeks still to go before voting day, political party election promises have been coming so thick and fast it feels like Christmas. National kicked off their pledges with the announcement that if re-elected, $10.5 billion over ten years will be invested in roading infrastructure. Ten of the country’s highest volume state highways will be upgraded to provide a safe four-lane network linking the regions to the major cities and unlocking their economic potential. In health, almost $400 million over four years will be used to increase doctor subsidies, so more people have access to $18 GP visits. The scheme, which is available to everyone with a community services card, is being extended – including to those living in state-funded housing or receiving an accommodation supplement – to deliver free or low cost healthcare to 2.5 million people. Over $1 billion has been earmarked for rebuilding Dunedin’s hospital. National’s ‘parents and newborns package’ costing $400 million over four years, includes extending paid parental leave from the current 18 weeks to 22 weeks in 2019, providing pregnant women with free dental care until their child’s first birthday, and for those struggling to conceive a baby, the IVF programme will be extended to allow for a third free cycle. National has also announced that almost $400 million will be spent over four years on four major education initiatives – introducing digital learning for senior students, improving the teaching of mathematics, providing all primary students with the choice of learning a second language, and expanding National Standards, to make it easier for parents to track how their child is progressing at school, including through their mobile phone. Another $60 million over 4 years will be spent on a defence-led boot camp based at Waiouru to crack down on the most serious young offenders and hold negligent parents to account. Altogether, National’s election promises amount to around $6 billion over four years. When it comes to Labour, in spite of their new leader’s repeated assurances that their spending pledges are moderate and affordable, the promises announced so far amount to a massive $30 billion over the next 4 years – five times more than National – with some manifesto undertakings still to be costed. Labour expects to spend around $4 billion on education, with almost half earmarked for delivering more teachers and boosting the profession’s working conditions. In addition they plan to scrap National Standards, repeal charter school legislation, freeze fees to private and integrated schools, and squeeze funding to private providers of pre-school and tertiary education. The balance of that funding – over $2 billion – will be spent on tertiary students, including increasing student allowances by $50 a week and introducing three years’ free tertiary education for anyone starting their studies for the first time next year, extending it to three years’ free by 2024. In health, Labour has promised to spend $8 billion, including cutting the fees for all doctor visits by $10, matching National’s plan to increase low-cost healthcare to those on housing benefits, rebuilding Dunedin hospital, and boosting mental health services. Labour’s families package, which will cost $4 billion, will extend paid parental leave to 26 weeks, provide a $60 a week baby bonus from birth to the age of three, increase Working for Families by $50 a week and extend it to 30,000 more families, and provide a winter energy subsidy to a million eligible families of $750 for couples and $450 for singles. Labour’s commitment to build 100,000 new houses is expected to cost around $2 billion, and their contributions to the New Zealand Super Fund, of $2.5 billion a year, would start immediately. Labour has also promised $3.5 billion to fund Auckland transport, including extending Auckland Rail, establishing light rail to Auckland Airport, and setting up a commuter rail service between Auckland, Hamilton and Tauranga. With a tight election race in Christchurch, Labour has pledged $300 million to the Christchurch rebuild, and $100 million to Christchurch transport. The big question is, of course, how does Labour plan to pay for their $30 billion spending spree? The answer is simple – new taxes. In addition to the $25 tourist tax on every visitor to New Zealand and an Auckland regional petrol tax of 10 cents a litre, Labour will cancel the $2 billion Families Income Package that was announced in this year’s Budget and has been legislated to come into effect in April. The package, which was designed to enable ‘ordinary’ New Zealanders to share in the benefits of economic growth, will deliver an average of $26 per week to around 1.3 million families from April 1st, reducing hardship for 50,000 children in low-income households. By lifting the bottom tax thresholds from $14,000 to $22,000 for the 10.5 percent tax rate, and from $48,000 to $52,000 for the 17.5 percent rate, most workers will receive $20 a week in tax cuts. Working for Families will also be adjusted with Family Tax Credits rising by over $9 a week for a first child under 16, and between $17 and $26 for other children. The Accommodation Supplement, which hasn’t changed since 2007, will also to be raised from $25 to $80 a week for most families, and in areas of high housing pressure, up to $145 more a week. The problem is however, that Labour plans to take this $2 billion boost to family incomes from those families that are set to receive it, and spend it themselves. In addition to this effective $2 billion tax increase on middle New Zealand, Labour is also promising a Capital Gains Tax. But since they have not provided any details, we are unclear whether it will apply to businesses, farms, shares, or any other form of investment. With the public having already rejected Labour’s Capital Gains Tax twice – at the 2011 and 2014 elections – this time around they are desperate to prevent it dominating the election conversation. As a result – in the hope that they can avoid further scrutiny – they have announced that their Capital Gains Tax will be referred to a Tax Working Group that will be set up after the election. So while Jacinda Ardern is busy claiming Labour is open and transparent at every sound-bite opportunity, their plan to impose a Capital Gains Tax before the next election, without any public mandate whatsoever, demonstrates the exact opposite. A democracy deserves politicians who are transparent and honest. Labour’s new leader is showing she is neither. The reality is that voters deserve to know exactly how much proposed new taxes are going to cost them, before an election. That’s what openness and transparency is all about – revealing the truth to voters, no matter how unpopular it might be. Like the Capital Gains Tax, Labour is also intent on hiding the true cost of their controversial Water Tax until after the election, by also referring it to their Tax Working Group. They know that a price on water will not only impact heavily on those being taxed, but that the cost will flow through to households, who will have to outlay more for all goods and services that use water. Adding to the controversy, Labour also knows that their Water Tax will trigger the largest Treaty of Waitangi claim in New Zealand’s history, saddling taxpayers with a new Treaty gravy train for years to come. Jacinda Ardern’s response, that this will not be the case, shows she is either incredibly naive, or dishonest – or perhaps both. New Zealanders need to be very wary about a spendthrift Government that defers crucial tax decisions to a Working Group that has been set up with the sole objective of recommending tax increases. Who knows what Labour’s Tax Working Group will recommend – perhaps it will be a capital gains tax on the family home, or the reintroduction of Death Duties, Gift Duties, or Stamp Duties. And who knows how much influence Labour’s politicians would have on their recommendations. In practical terms, such a Group is likely to recommend whatever Labour wants it to recommend, while acting as a suitable scapegoat – but the reality is that we don’t really know. 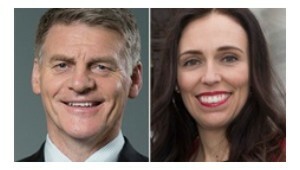 Essentially the differences between the two major parties comes down to an underlying belief in how far a government should encroach into the lives of ordinary New Zealanders, and who is the most competent economic manager. On one side, National is saying we don’t need more taxes, if we manage the government’s finances well. Stick with us because you know we are competent, and can be trusted to run a strong economy. We’ve pulled the country safely through three emergencies that could have thrown us into recession – the global financial crisis, the Christchurch earthquakes, and a major commodity slump – and given the chance, we will continue to deliver for New Zealanders as we have done over the last nine years. On the other side, with Labour, we get the same tax and spend policies, but a more energetic and photogenic leader. They are saying trust us because we are passionate and positive – and with your help, we can change the government. There should be more fairness in society, so we’ll ensure that well-off New Zealanders pay more to enable the rewards to be spread more widely. We are ready – let’s do this. In this close-run election race, some of the minor parties will become part of our new Government, so let’s look at what they are promising. The Greens’ pledges include a 20 percent increase in the value of all welfare benefits, generous winter power subsidies, universal student allowances, free tertiary education, the scrapping of student loans, major investments in public transport, and more penalties for dairy farmers. The Maori Party’s new spending plans include developing an IwiRail regional train network, building 90,000 affordable homes, writing off the living cost component of student loans, introducing a universal student allowance, and creating thousands of new Whanau Ora jobs. ACT is the only party wanting to decrease Government spending, and reduce taxes, by promoting a 25 percent cap on income tax and company tax. New Zealand First is almost neck and neck with Labour over spending promises, including removing GST on fruit and vegetables, introducing a universal student allowance, scrapping student loans for those who work in New Zealand, building a rail link from Whangarei to Marsden Point and upgrading the line to Auckland, moving the Auckland container port to Northport, and buying back the power companies sold during National’s 2012 partial privatisation. New Zealand First also appears to be the only party raising concerns about the escalation of race-based privilege. Winston Peters has pledged that if he is part of a coalition government, a public referendum on abolishing the Maori Seats and on reducing the number of MPs in Parliament, would be a bottom line. If New Zealand First does end up becoming ‘king-maker’, it will be early October before we know how committed they are to a referendum on the Maori seats. While polling booths open for early voting on September 11th and the election is on September 23rd, Winston Peters has said that, if he is in a position to do so, he will make a decision about which party he will ‘crown’ to be in Government by October 12th when the writs with the final election results are returned. This week we are asking you to make a call: Who do you think will lead the next Government – National or Labour? Labour with the help of NZ First will be the next government. Just look at the National TV add, they have NZ First aligned that way already. Won’t make any difference at the end of the day. Both Parties dance to the tune of their globalist masters. Look how John Key endorsed every-thing Helen Clark had put in place, & Bill English couldn’t wait to ratify the Paris agreement on CLIMATE CHANGE. Notice how there is only a Promise Auction going on between the two Parties, with no mention of a long term employment strategy for a sustainable future. A.G.R.